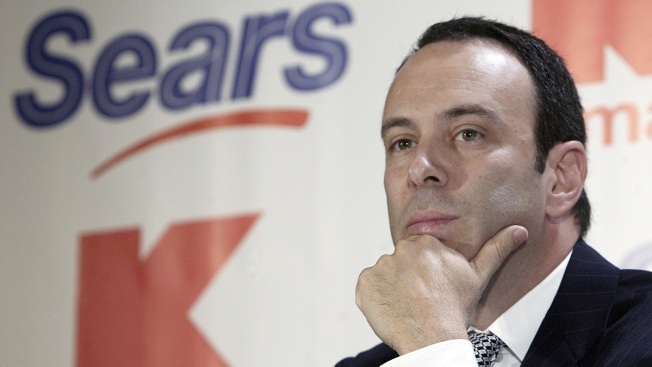 FILE - In this Nov. 17, 2004 file photo, Kmart chairman Edward Lampert listens during a news conference to announce the merger of Kmart and Sears in New York. Sears said Thursday that Chairman Eddie Lampert’s hedge fund, ESL Investments, is the winning bidder in the company’s bankruptcy auction, keeping the company alive. “We are pleased to have reached a deal that would provide a path for Sears to emerge from the Chapter 11 process,” the board’s restructuring committee said in a press release. Subject to court approval, ESL will acquire substantially all of Sears’ remaining assets, which includes 425 stores, for about $5.2 billion. Sears’ other brands include its Home Services business and Kenmore and DieHard brands. The largest remaining question pertaining to the deal is Sears’ unsecured creditors, which are opposed to the bid, people familiar with situation have said. ESL and the company’s unsecured creditors have struck a deal in which Lampert paid $35 million for the right to help fund his bid by forgiving debt owed to him through a “credit bid,” people familiar with the situation tell CNBC. The deal, though, did not address potential litigation the unsecured creditors have threatened they may lodge over deals Lampert did during his tenure as Sears’ CEO and largest shareholder. The unsecured creditors have said there may be claims against Lampert for deals that include Sears’ spinoff of Lands’ End in 2014 and transactions with Seritage Growth Properties, a real estate investment trust Lampert created through some Sears’ properties a year later. Sears’ unsecured creditors have eight days to formally object to ESL’s bid. Sears will then have two business days to issue a response. The bankruptcy judge overseeing the case, Judge Robert Drain, will need to assess the merits of any objections at a hearing set for Feb. 1 at the Southern District of New York Bankruptcy Court in White Plains. Pending Drain’s approval, a deal will close on or about Feb. 8. Drain has so far shown a propensity to keeping Sears alive. After disagreements between Sears and ESL in an auction for the retailer earlier this week left the two in a stalemate, Drain encouraged the parties to resume talks. Ultimately, Sears and ESL were able to come to a resolution in the early hours of Wednesday morning. ESL’s offer has been the only one that would keep Sears alive and preserve thousands of jobs. Its final offer for Sears will preserve 45,000 jobs. “ESL has been steadfast in its commitment to Sears because we believe that its emergence from Chapter 11 as a going concern is the best path for the company, its associates and the many communities touched by Sears and Kmart stores,” a spokesperson for ESL said in a statement Thursday morning.